The heart is indeed the sounding chamber of BEING. Heartfelt emotions are real, ever as our perceptions define them. Joy, pain, trauma, stress, love, abuse, care, emanate a spectrum of vibrations. Each vibration bears its life giving or life compromising effect. Vibrations that sustain healthy cell communication, balance, harmony, pain relief, stress reduction, are indeed welcomed by body, mind and spirit. Each organ, each organ system, each chakra, each meridian, carries vibratory messages. When all systemic systems entrain* with their balancing vibration, wellbeing is brought forth. The APOGEE Acu-Tone™ evaluation identifies the chakra, the organ system, the meridians, the acupuncture points, that are at issue. This assessment defines which tone/frequency is to be applied to identified cranium points and acupuncture points. Entrainment is the result of the application of tone/frequency via calibrated tuning forks onto the determined points of receipt. Entrainment is experienced as a calming resonance, as a state of renewal, as feeling balanced, energized, awakened, with a deeper awareness of self. The documented results, the testimonials from those who have experienced the process, certainly speak to the myriad of welcomed benefits. *Entrain: Biology of a rhythm or something that varies rhythmically cause another gradually to fall into synchronism with it. New Oxford American Dictionary. 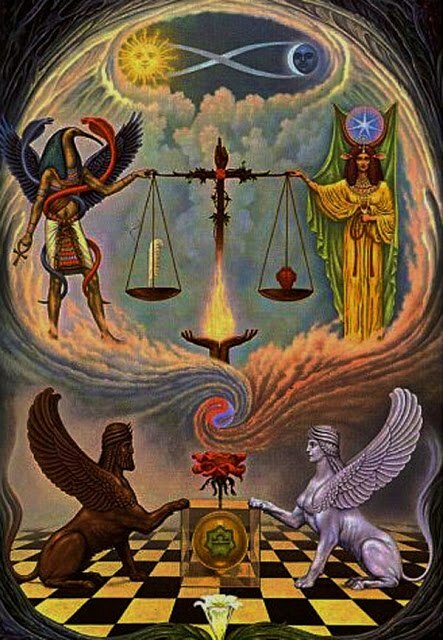 Each chamber of our hearts... the receiving, the giving, the inhalation, the exhalation, the ebb and flow, the cresting and soaring waves of BEING, the balance, the pulsing, for breath, for LIFE itself, weighed by THOTH, as the lived expression of our moons and suns of BEING. Photo source: THOTH Weighing of the Heart: FB posting of Hector Vazquez.